Unlocking the Prodigal Event and Resource. An Unlock Bible activity event based on Luke 15. This took place at Windy Nook in Gateshead and again in Heanor in May 2018. In December I chatted to the people who came and got overwhelmingly positive feedback. The gist of it was that it had taken a story they were very familiar with and helped them see it with fresh eyes - that it had helped it move from something they knew with their heads, to something that touched their hearts, and that it had provoked some deep and helpful conversations, arising out of the themes of the parable and the way it connected with their own lives and experiences.They saidit had been a lot of fun as well, and that the lunch was good! I was asked some really good questions by church members, such as, "How can we do more of this, for ourselves?" and "How could we draw in those on the edges of the church, who don't already know the stories in the Bible, for something a bit like this?" I look forward to exploring what the answers to those questions might look like, in the months to come! Our Lent course has had a very strong Unlock influence and it's been such a great experience.We are a church full of very practical, down to earth people who tend to be quite private about what goes on inside them and not have huge amounts of confidence.Unlock hasenabled usto share our experiences of prayer and God in a much moreopenway.That, in turn has led to a new courage and willingness to pray for and with one another, which makes me a very humble, grateful, happy Vicar indeed. Exciting developments now in Woodhouse Sheffield. Next . . . We always interested to hear from new places who would like to develop some Unlock work. We focus on deprived urban commiuties. Contact the National Office if you want to know more. We are currently process a request for an Unlock worker for Rotherham. 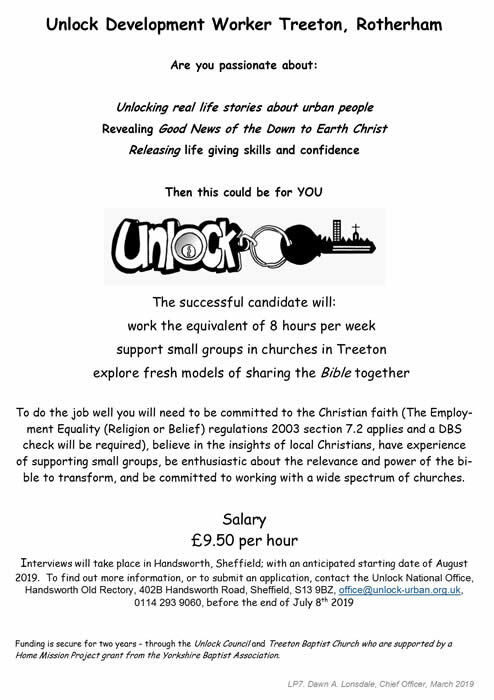 Unlock is now working in partnership with the Queen's Foundation, Birmingham and the Lindisfarne Regional Training Partnership, and is willing to explore the possibility of partnerships with other Theological Colleges and Ministry Training Programmes in the UK, particularly in regions where we already have local projects established. 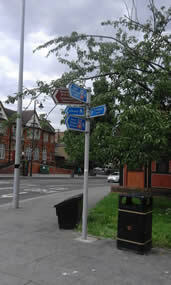 The next Unlock London Walk will be on Saturday 28th April 2018 in Tottenham and Harringay. The Next Unlock London Walk will take place on Saturday 27th April 2019. It will take place in Merton, Morden and Wimbledon. The event above takes place at Queen's every December. You do not have to be a student at Queen's to attend this training day; it is open to anyone. Please contact the Unlock Office to book a place. Training can also be arranged for a local group; see this leaflet for details. The brochure below gives details of Urban Mission Training available in (or from) the Midlands and has been produced by a partnership of agencies brought together by the Urban Mission Development Project. Any organisation which places Christian workers in Urban Mission contexts is welcome to approach Unlock to provide training for its workers. Unlock T Shirts and baseball caps, which are on sale at Unlock London Walks, in a range of sizes and colours priced £6, are now available from the National Office (0114 293 9060, office@unlock-urban.org.uk) for £6 plus P&P. Please specify size and colour required. People who want to walk, or coordinate a group from their church, just need to contact the office for sponsor forms maps, etc. Churches on the route provide refreshments of various kinds for walkers to buy including lunches, or people can bring their own. Donations can be sent to the office. Donations from our supporters fund 87% of our work - they are vital to help us continue to develop local projects, & produce Bible study materials, workshops and consultancy. Photography by Tim Watkins-Idle, Andrew West & Steven Lonsdale.